This month is Thanks Giving Month and let’s starts with a one pot casserole dish that can occupy a prominent place in your Thanks Giving menu. If you are hosting a Thanks Giving dinner or having potluck then Baked Mustard Green Pasta would be your best option. It is a unique recipe that will stand out on the dining table and everyone can happily indulge in it due to its nutritional value. Your guest won’t stop licking even the last bit of this recipe and you will be flying high with all the appreciations. For this I firstly flavored the warm oil with all the herbs that were standing eagerly in my spice shelf to be used. 🙂 Then I added low fat milk and whole wheat flour to make a sauce for the pasta. Seasoned the sauce and tossed the pasta into this herbed sauce. Almost there!!! Half of the recipe is already ready. Now comes the layering part. 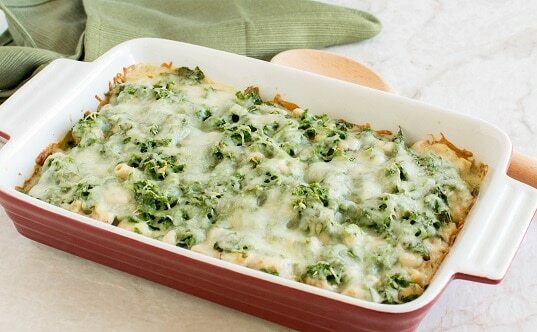 Fill the bottom of the baking dish with the cooked pasta and add the second layer of fresh chopped mustard greens, and again add another layer of the rest of the pasta followed by the rest of the greens and finally covering the dish with lots and lots of yummy cheese. Put the baking dish in the preheated oven and bake. Serve warm with your choice of side bread or garlic bread and devour. I used fresh mustard green leaves as the main ingredient for this recipe because not only are these greens are in season right now but they are extremely healthy vegetables that should be included into our diet. These leaves are peppery in flavor and crispy in texture. These greens are low in calories and high in vitamin K, vitamin A and B-complex and are good source of folic acid. They have essential minerals like iron, zinc, magnesium and promote eyes and skin health. Heat oil in a pan and add all the herbs (oregano, garlic, chili flakes, basil, and parsley) and mix them in the oil. Now add onions and sauté for a minute or until onions are translucent. Now add milk and flour together and stir until there are no lumps. Add salt and pepper and bring it to a boil. Simmer the flame and add pasta. Toss the pasta very well so that pasta is well coated with the sauce and turn off the flame. Preheat oven at 350 degree Fahrenheit and prepare a baking dish of your choice by greasing it. Now for the layering, cover the bottom of the baking dish with half of the pasta. Add another layer of half of mustard green leaves. Then repeat the layering process by adding the rest of the pasta and followed by mustard greens. Cover the top of the dish with cheese and place the baking pan in the bottom rack of the oven and bake for 20 minutes. Turn off the oven and serve warm. Make sure to chop mustard green as fine as possible. Serve it warm and feel free to sprinkle some red pepper flakes according to taste. Avoid baking in the middle rack because if you bake in the middle rack cheese will melt faster and start to burn while mustard green would be raw. For mustard green to cook sufficiently it is important to place the baking pan at the bottom rack of the oven. If you feel that mustard green leaves are not soft enough or cooked bake it for another 5 more minutes. Do not exceed 25 minutes of baking time as the cheese may get burned. Any pasta of your choice can be used and this dish can be served with a side of bread. Do not overcook the sauce and make sure there are no lumps.